Life is about the little joys and celebrations that we wish time would bestow on us more often. I do get my share thanks to God’s benevolence. Jyotsna also has a BIG hand in it. Her name ‘Jyotsna’ means- ‘Moonlight’. She has proved to be so for me! 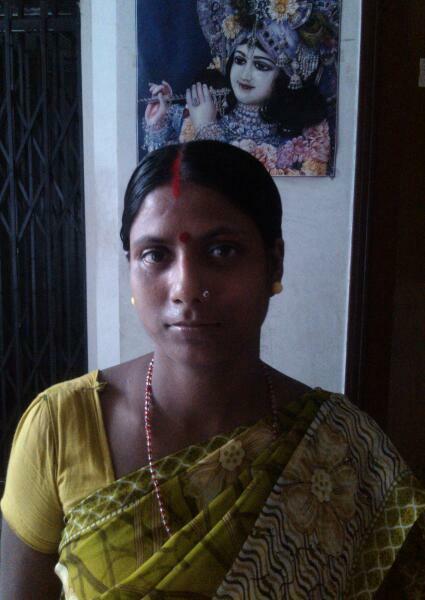 Jyotsna works as a maid in our building. She sweeps, mops, washes utensils, chops vegetables, cooks, washes clothes…and does other odd jobs in ten flats in our building. In my place, she does the first four. Jyotsna is my choice of Mia Woman. I know mine will be the most different entry & some may scoff … Jyotsna is a Mia woman as she is independent, confident, a quick-learner, open to change, ready to help, is a pillar of support and strength, is trustworthy and super-efficient… Like Mia Jewellery, she is 'light and unflashy', yet has a sparkling personality of her own. She returns my smile even at the end of a hard day's work! Yes, she works very hard for a living. Jyotsna can afford to buy Mia Jewellery; but she perhaps never will…That will entail blowing up her entire month’s salary… She has four doting kids and a very loving husband. Work is worship for her. Yesterday was Independence Day. No independence from work for her even on the supposedly National Holiday! Jyotsna doesn’t take holidays just like that (unlike the other maids in our building). If she does have to be absent, she calls up to inform. Yes, she does have a cellphone that she smartly uses! She is keen to learn how mobile phone works and to use the advanced features. The other day, I taught her how to ‘block’ the number of the driver of the Nano-Car by which she travels. The guy was bothering her as she travelled to work in his Nano-Car and had to occupy the front seat beside him! Just because she has a very affable nature, it's easy for people to fall in love with her! When she succeeded in blocking him, I could see the shine on her face, the unmistakable glow of empowerment! I had seen the same when Jyotsna had opened her own bank-account. She now religiously deposits her monthly savings. Initially, she took my help to fill up the deposit-slips. But, now I am so proud that she is a pro! If I am not at home, Jyotsna just takes the keys from my neighbor and completes the house-keeping works, leaving behind a neat and clean welcoming home for me. And if I have forgotten to give vegetables for chopping, she demands that I do…will not leave till she has completed her scheduled works! If I have not eaten lunch, she gives me a good scolding as she doesn’t have any utensils to wash in the afternoon!!! I like to save a part of the goodies and share everything with her- even a piece of chocolate cake or snacks or sweet! The other day, when I made Kheer, after serving the first portion as prasad for God’s worship/Puja at home, I kept the second helping for Jyotsna. When I revealed this to her, she was very amused and said, “So my importance for you is after God!” She wasn’t very far from the truth... For me, Jyotsna is God's angel for me and a part of my family. God has been really kind to put Jyotsna in my life. I can continue working as I please on my Research or on my online activities, while my part-time house-help helps maintain my home! I must share that she has happily been a part of my Videos and photos, that I have specifically shot for contests, by patiently acting & posing, including for this Tanishq contest! She provides her feedback during development stage and cheers for me when I win! And I must add that she wears the Saree really well. On request, she helps everyone wear Sarees and is much in demand especially during important functions or events in our Society! I do know how to wear Saree and people say I manage pretty well. But, when my Saree gets the professional Jyotsna-touch, the pleats are better, my tummy is fully & smartly covered and the overall get-up looks excellent! I get more compliments, just like I do when I wear Tanishq Jewellery! 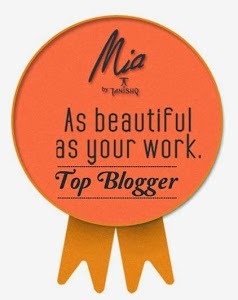 This post is for the Blogger Contest- Mia by Tanishq. This Post won the Consolation Prize and this beautiful Winner Badge in the Contest! Thanks Megha! Appreciate your feedback! Jyotsna & I have got many reasons to smile ever since I wrote this post about her! Touched with the great feedback in the past couple of days! Many Congrats to you as well for winning the same prize!